Wreaths decorate Main Street USA in Walt Disney World's Magic Kingdom. 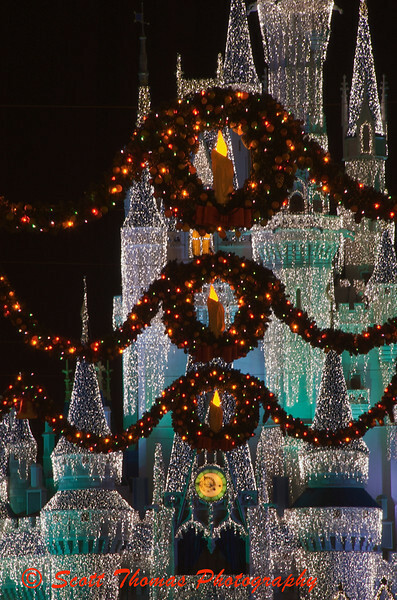 This entry was posted in Travel and tagged castle, christmas, cinderella, decorations, disney, florida, lights, magic kingdom, orlando, Photography, walt disney world, wreath. Bookmark the permalink. Nice shot Scott. I’ve never seen Disney at Xmas. You are all most welcome. I’ll get back to my regular blog on Monday as I finish out my 52 week project. Once I get through all the photos from WDW, I’ll put together a gallery for you all to visit. We just have to go there some day, it looks so fantastic. Thank you for showing. I´m looking foreward o see the gallery. Birgitte, they do the same at Disneyland Paris for Christmas. In fact, they did it first and it was brought to the other parks over the last couple of years. You should check it out. I also have never seen Disney World at Christmas time. Your photos bring me there and I love it! Thanks.